I'm really missing Margaret right now. We need some face time, and not the Apple iPhone kind! So tonight I have a card to celebrate our friendship. I used the sketch at Digi Sketch Challenge. 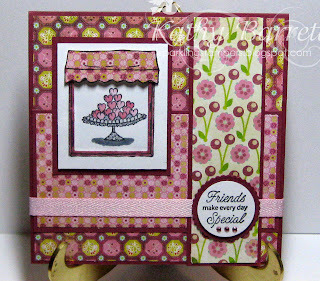 The heart image is from Lockhart Stamp Company, colored with Copics and Spicas. The window, also colored with Copics, is an Art Impressions stamp, and I used a Spellbinders die to cut out the center where the glass would be. I added foam tape to the back side and mounted the heart image so it would give it some depth. I fussy cut the awning, also attaching it with foam tape. The dp is Basic Grey Lemonade and cs is from my stash, as is the strip of ribbon. I used EK punches for the sentiment, stamped with Versafine Onyx Black, produced by JustRite. I added 3 Swarovskis beneath it for a little added emphasis on the word "special". Makes me want to jump in the car and run to a bakery for a latte and a cookie or cupcake, how about you? This card is just stunning. I love the deep, rich maroon of your card stock, and how all the design papers go so beautifully with it. Great job on that window! Thanks for linking to Cut it Up Challenges Going in Circles Challenge! 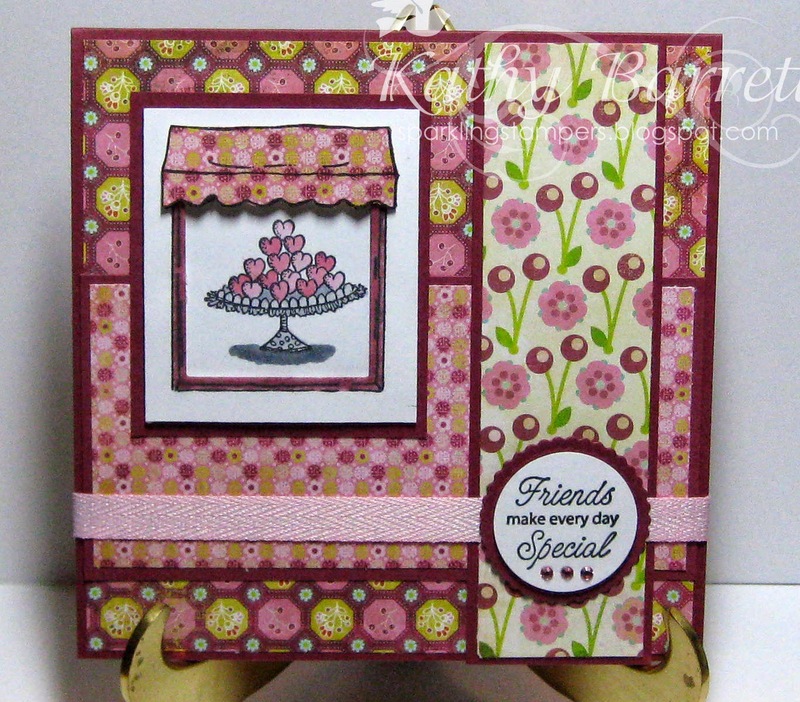 Kathy, I love all the layers of this sweet card! And I still have BG Lemonade in my stash too. An oldie but goody! Thank you for joining us in our Going in Circles challenge at Cut It Up! I can't wait to get it! I LOVE the papers! 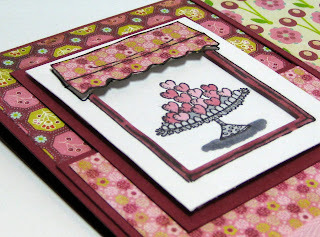 And the idea of the "cake stand" in the window is absolutely adorable! This is lovely, I love what you have done with the image so creative. Thanks for playin along at Digi Sketch Challenge. LOVE your paper!!! AND colors!!! You layout is awesome too! Thanks so much for joining us at Cut It Up Challenges! Wonderful card! One of my fave paper collections too! The layers are perfect on this card. Thanks for joining us at Cut It Up!